Pingback: How to Restrict users to local domain for Zimbra 8.5? for this policy, if i want user1@imanudin.net to only receive email from local domain and other specifit domain, how can it be done? is it will work if i only add 2nd policy member on : Policies | Main Add member to new policy and fill on source with group list_domain and on destination with group users_local_only ? my goal is to restrict account email to receive from local domain+specified domain and send only local domain+specified domain. are you has been make sure status on disable become no to all groups or Policy you are create? Oh yes, cant belive that I have missed some enabled button 🙁 It works now! displaying above error please help i am running this cmd on mail server not on mta server.. This guidance is for Zimbra 8.5 and latest. What Zimbra version are you using? hi iman please help me for this article i really need your help,i want to restrict my some users only to local use which is only in my domain or just can you tell me command for enable access control module for in policyd please i really appreciate your help..
hi, has anyone ever had to limit the sending of attachments per user? I Have configured as per your guide, and i verified all, but its not working. help me. What Zimbra version you are using? are you has been make sure all rule/policy has been change from disable=yes into disable=no? Yes. I am using Zimbra Version :8.5_GA_3042.FOSS. I delete the users_local_only, and create the another one. same error comes. Release 8.5.0.GA.3042.UBUNTU12.64 UBUNTU12_64 FOSS edition. Note : I delete the policy which i was created before run the command.. Please configure again PolicyD and check log /opt/zimbra/log/cbpolicyd.log if still problem. I configured like users_local_only. Now i configure as the picture and it’s working fine. If you have the time. pls look at the question in community. If you have the time please look at my another questions. If i use thunderbird or outlook, mail goes to sent folder, but not delivered to the destination. same time i didn’t get any log in cbpolicy.log file. Please check also any log in zimbra.log. user1@domain.com able to receive mail from only hsakthi@gmail.com. Pls Help – Not Working as reverse. All disabled are set to No. I changed the @ to _. and restarted the service. but nothing works. Help me to find out the issue. First of all I must say that this post is really good and thank you so much sharing your knowledge. I am using Release 8.6.0_GA_1153.RHEL6_64_20141215151155 RHEL6_64 FOSS edition. 1. If I want to restrict for local domain as well and only allow one public domain for incoming and outgoing traffic then how to do that. I have added only one public domain as per above steps. It worked but it is allowing for local domain as well which I don’t want. 2. If I select ” Reject OR Discard” under Verdict, then I get “Relay access denied” in zimbra logs which is fine but these restricted mails get stuck in deferred queue. I want them to get drop in these conditions. How to do that ? 3. If we enable this restriction then, sender user should get bounce back message as a information that he does not have access for the same. How to configure it ? 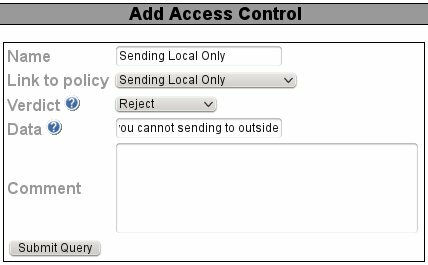 Please help us to install and configure cbpolicy in zimbra 8.6.0 with multiserver environment (ldap1, ldap2, mta, mbx etc.). From Islami Bank Bangladesh limited. I tried to configure exactly the same as yours, but it isn’t working. Release 8.6.0_GA_1153.RHEL6_64_20141215151155 RHEL6_64 FOSS edition, Patch 8.6.0_P6. Plus, it doesn’t logged in the zimbra or cbpolicyd log. Yes you can. You only need to configure source and destination as do you want. The example in this article could be developed to many aims. From user1 and user2 can’t sent mail to user2@domain.com ? First i would like to say for the article. I followed this and implemented as it is. In that i added my own hosted domain and some other few. whenever sending to these i am getting that restricted pop-up but i click ok at first time next time mails are sending normally. please help me on this. Did you mean user restricted can sending email to another domain? or normal user getting pop up on the first time when sending email? I have a urgent requirement for a particular user, he can only receive mails but to restrict him from sending of any mail. How can we do that?